What a beautiful Macaw Parrot! All those lovely colors. They are spectacular birds. 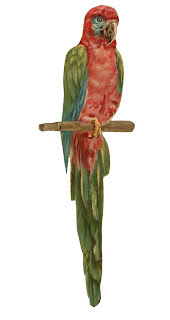 This wonderful parrot clip art is from a very large Victorian scrap from one of my scrapbooks. It measures approximately 10 inches. I hope you enjoy!